No longer content with abducting cows and harassing the rural population of North America, the Martians have set their eyes on Crucible. The new preview for KeyForge presents the House of Mars, a species of literal little, green men with high tech weaponry and an army of clones. New scenarios are one addition every Mansions of Madness expansion brings. New investigators are the other. As usual they’re old friends from other Lovecraftian Fantasy Flight games, but in new interpretations. They all have useful abilities or special items, but I’m especially intrigued by the sailor Silas Marsh here. His reroll ability is very powerful, but flipping one of your Madness cards to use it makes it a risky, strategic choice in late game. You don’t win gang wars sitting around and playing table tennis. That’s even more true when the world you live in is a cyberpunk dystopia. The latest preview for Plaid Hat’s Neon Gods shows the two big things your gang members should be doing: Fighting and working. I like the part where you can send thieves into combat to steal money instead of doing damage. Reprints? Expansions? New publisher Funtails will do better than that. 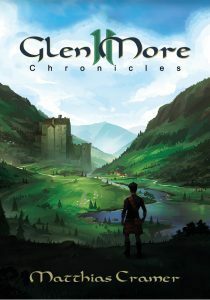 Their first project is going to be Glen More 2: Chronicles. Designed by Glen More‘s original author Matthias Cramer this sequel will feature about 33% of Glen More‘s most popular features, 33% improvements of same, and 33% all new and exciting content. Mix thoroughly, bake for a couple more months, and keep your future players excited what exactly Glen More 2: Chronicles will include. I’m certainly excited to learn more. The announcement for Portal Games’s big, new releases for 2019 will only be made early next year. For now, we get to see some expansions for their existing games – which is plenty exiting as well. 51st State: Allies will keep the promise from its title. New cards for the post-apocalyptic tableau building game will feature an all new alliance mechanism that, as far as we can tell from the announcement, rewards bringing together cards from different factions. Allies will also introduce new players in the toxic wasteland, namely the Steel Police, Uranopolis and the hyper-intelligent rat mutants Sharrash. In Breakthrough, the second expansion for Alien Artifacts, 40 new cards will grant you access to even more alien technology that we don’t really understand, but that we’re still going to use for fun, profit, and galactic conquest. We already knew about Robinson Crusoe – Mystery Tales, the second big expansion for Robinson Crusoe: Adventure on the Cursed Island, but it’s still fun to bring it up again. Especially since they really mean it when they say it’s a big expansion. With this expansion you’ll get the five scenario campaign searching for The Lost City of Z, two more stand-alone scenarios, ten new characters, new event and adventure card, and a sanity mechanism that you can add to all your games of Robinson Crusoe to add that little touch of horror. Question first on this next one: what is a stand-alone expansion? Either it’s stand-alone or it’s an expansion, those things are mutually exclusive. Anyway, Stronghold: Undead is a second edition of an expansion. It adapts the original Stronghold: Undead to work with the second edition of Stronghold. Nothing changes about the basics of Stronghold. One player wants to get into the keep, no matter the cost, the other player would rather he didn’t. Only now the attackers are the living dead and if they get in mankind is doomed. But no pressure. Finally, L.A. Crimes will expand Detectives with three new cases fresh from sunny 1980s Los Angeles. Besides the awesome, new setting there will be five new characters and mechanism for Stakeouts and Observations. I hope those new mechanics include the risk of someone plugging your tailpipe with a banana! I have an admission to make: Tactical miniature games don’t excite me, no matter how pretty the minis are. I’m not saying those games are bad, or that no one should like them. All games are awesome, some are just not for me. I still look at them on Kickstarter, though, because they do look great, and sometimes they come with an exciting mix of mechanism that gets me intrigued, after all. CMON’s Project: ELITE is one of those games. Your soldier miniatures must complete missions against overwhelming alien forces. Mkay. They do that in eight rounds of frantic real-time dice rolling, trying to get the action symbols you need without triggering too many alien moves. Now you have my attention. Dominion is finally leaving the Middle Ages. 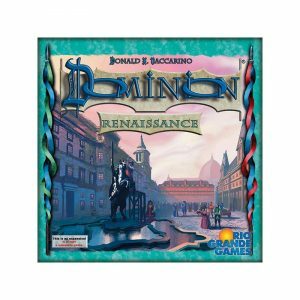 The 12th expansion to the grandfather of all deck-building games is titled Renaissance and takes players to a golden age of arts and sciences. Rule-wise the big, new thing are going to be Projects. They are special cards that don’t go to your deck, there’s just one copy of them open on the table. When you pay to place a cube on them they have a special effect that is always active for you. For example, if you invested in Silos you may discard all your copper at the start of your turn and draw that many new cards. A useful thing to have around. It’s been twenty years since Catan: Cities & Knights was released. Bloody hell. As an anniversary gift for all Catan fans we’re getting Catan – Legend of the Conquerors, an expansion with three scenarios that tell the story that happens after. In Cities & Knights the island of Catan has developed into a strong nation with prosperous cities and scientific development. In the three new scenarios a mighty nation from the home continent wants to conquer Catan. The players have to fight off their armies.